Devin Tuinstra grew up on a farm in Ancaster Ontario. Despite growing up immersed in a world of horses, crops and livestock, Devin found his passion in technology at a young age. Devin began working heavily with computers at age 5, professionally over the internet at 14, and later founded his first software company at 18. Devin’s work has brought him across Canada, and the USA as well as China; where he learned Mandarin and discovered a deep respect for Chinese culture. Devin and his wife Cait have been married for 8 years and live in West Flamborough. They have two young boys, Rain (5), and Jarvis (3). Devin’s Masonic career began upon his own research into the past of his grandfather Herbert Stott, which led him to join Landmarks/Doric Lodge No. 654 as his mother Lodge in January of 2007. 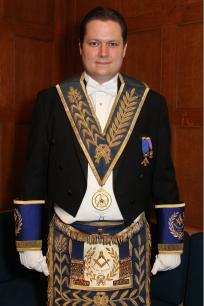 While serving as Deacon in Landmarks/Doric Lodge, Devin affiliated with Dufferin Lodge No. 291 which is located close to his home. Devin was later installed as W.M. of Dufferin Lodge in 2012 where he served for two years. At the District Level, Devin co-founded the District ‘C’hronicle with R.W. Bro. Wayne Elgie in 2008, as well as built the District C Website. Devin served as Communications Chairman from 2008 through 2012, as Lodge Resources chairman in 2013, and most recently in the capacity of Masonic Education chairman in 2014. Devin has also served as a Director for the Craft Association. Since 2011, Devin has been actively working with the Grand Lodge Web Technology committee which has rebuilt the Grand Lodge website here in Ontario. Devin is a 32° member of the Ancient and Accepted Scottish Rite, and currently serves as the Grand Standard Bearer where he sits on the executive of Moore Sovereign Consistory and as a director on the board of Towers. Devin has a deep respect and passion for the Craft and is very much looking forward to serving the office of District Deputy Grand Master.